These incorporate a self Jetting head with a non-return plastic ball valve, a P.V.C. slotted filter screen, a G.I inner drain pipe and a top coupling which threads to standard 1 ½" (40 mm) riser pipe. The serations on the jet head render penetration, even through hard grounds, easy. Specially designed slots of PVC screen, allows maximum water flow with minimum pressure drop and prevents passage of even fine material. 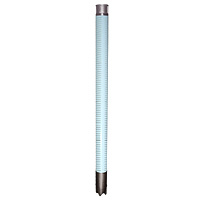 The plastic screen eliminates clogging due to corrosion or deterioration due to chemical action. It has a reverse self cleaning design to void choking.